This incredibly detailed puppet of the Wheatley from Portal was sent into us, and we a so very happy that we’re not writing about a GLaDOS build right now. Hewn from florist foam and covered Wonderflex and Apoxie Sculpt, Wheatley pretty much tows the line as far as cosplay and prop builds go. 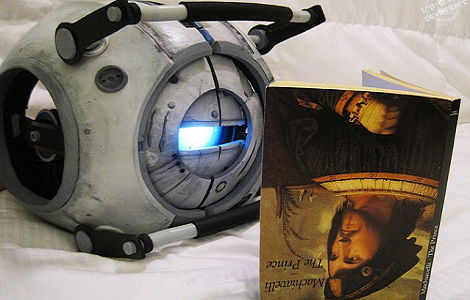 What makes Wheatley interesting is his movement mechanism – he’s actually a hand-controlled puppet. Portal quotes come a small sound module that plays 10 Wheatley quotes. The control system has ten buttons and allows for the display of a lot more emotion than we would expect from a talking sphere. We really like the completely manual solution to an articulated robot eyeball – a really great, simple solution to a complex problem. Like the portal turret and the adorable and friendly companion cube, we’re really impressed with the build quality of Wheatley. Yet again we’re left wondering why Valve doesn’t license some awesome toys like their office sentry. Check out the intelligence dampening sphere in action after the break.